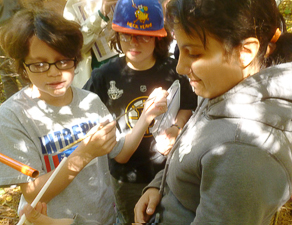 Forest Watch conducts basic and applied research on New England forest ecosystems. Data is collected by teachers & students (gr. K-12), from trees in their study plot. Forest Watch is funded by the N.H. Space Grant Consortium, located at the University of N.H. Institute for the Study of Earth, Oceans, and Space. Forest Watch in Action. 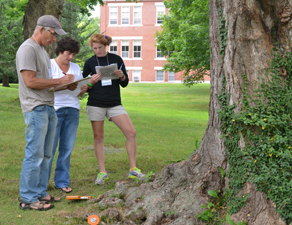 . .
Each year Forest Watch offers a Teacher's Workshop on the campus of the University of New Hampshire. The 2014 workshop is scheduled for August 11-13. Coring a tree is one of students' favorite activities. The rings in the tree, as these students are learning, tell a story of the tree's history. Urban schools also participate in Forest Watch. 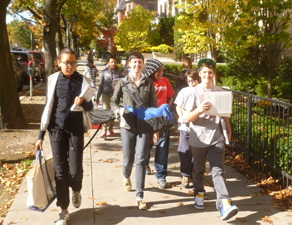 These students walk two blocks to a city park to visit the white pine trees they are studying. 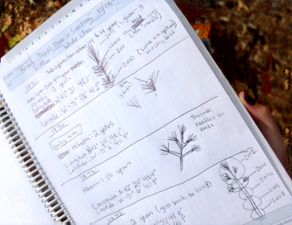 A student field notebook shows a white pine’s location, height, diameter and more. Careful recording of data is just one skill Forest Watch students learn. 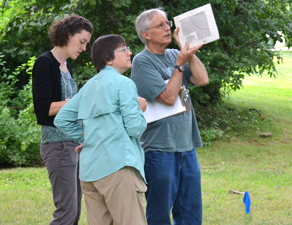 Teachers practice using a clinometer to estimate tree height, an exercise they will use with students to record data on trees in their study plots. 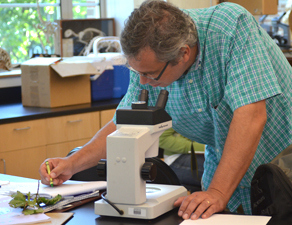 An excercise in examining Maple leaves, part of the Summer 2012 workshop at the University of New Hampshire. 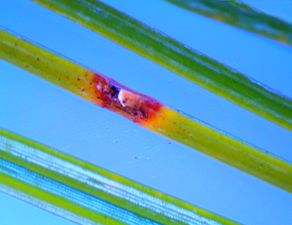 Propose an experiment to test pine tree health using pine needles.